While we were reporting an apartment block fire on October 16, a foreign student offered us some dramatic video footage of the blaze and the rescue efforts of the firefighters. He introduced himself as Semion Voronin from St. Petersburg, Russia, a former ITAR/TASS intern, now on a one-year program of Chinese at Capital Normal University (CNU). He told us he is a big fan of China. Semion has only been learning Chinese for 8 months but he is already able to get by, and his pronunciation is so good that he could almost pass as a local. His enthusiasm for this language was ignited at St. Petersburg State University, the institute that produced Vladimir Putin and Dimitry Medvedev. He majored in Oriental Studies and when he graduated six months ago, was already fluent in Cambodian and Vietnamese. Somewhere along the way he also picked up English and French. Vietnam, he started formal study of Chinese during his last year in college. "I think Chinese is the most important East Asian language right now", he said. "Many Russians do business with China, but few of them speak Chinese. So they are always on the lookout for people who can speak the language fluently, especially if they also know something about business." But Semion is not just learning the language to make money. "To be honest I'm not sure why I'm studying Chinese, I just know I love the language and I want to learn it." "I think Chinese will replace English as the international language before long, or at least achieve the same status as English," the 22 year old Russian said confidently. Semion also studied kungfu and calligraphy back in Russia and a professor in the university's Confucius Institute recommended CNU. But he hasn't found a martial arts teacher yet. 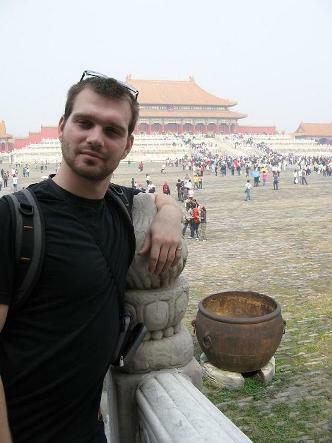 Like every other first timer in the Chinese capital, Semion found Beijing huge and formidable. "When I first got here I was afraid to go out by myself, and I didn't dare take the bus because I thought I would get lost," Semion said. Two months later he has found his way round the whole city and has visited all the main sights like the Forbidden City, Beihai Park, Qianmen, and the hutongs. "To us foreigners, hutongs are the real Beijing, not the skyscrapers." Semion says, "I know life has changed over the years in Beijing, but the quintessential image of Beijing is still one of hutongs and quadrangles." "In the same way, the world sees Russians as drunks who carry vodka bottles wherever they go. Obviously life in my country isn't like that at all. Perhaps we can say both impressions are stereotypes?" Semion continued, smiling. With a few months' part-time experience at ITAR/TASS, Russia's main news agency, Semion is a fellow-journalist. On Oct. 16 when he saw the fire, his professional instincts took over and he started filming. He hopes to return to TASS as a correspondent after he adds Chinese to the Vietnamese he already speaks. Since the fire incident he has been working for the Russian department of China.org.cn as a part time editor, and strangely enough, he also teaches English in a local middle school. When asked why he teaches English rather than Russian, he laughed, "There are already enough Russians teaching. I don't think they need one more." He adds that outside the classroom he speaks English rarely; the rest of the time he concentrates on improving his Chinese. "I am not sure what I will do after I finish at CNU. Maybe I will stay in China for a while. I would like to see some more of the country." For information about studying at Capital Normal Univeristy, check here.